Companies are facing new demands. Clients want a more strategic partnership that reaches beyond cost containment and compliance. Smaller organizations want an MSP/VMS solution built for a non-enterprise scale. And 33% of global companies have transitioned to an internally managed program (IMP). That figure continues to rise, driven by clients who desire MSPs to develop more nuanced value propositions that satisfy services such as direct sourcing, strategic collaboration, and workforce planning. With the rigors of simply performing their core duties, little time and resources are left for MSPs to undertake these more strategic efforts. That’s precisely where the crowd-based power of the Human Cloud comes in. Imagine a world where MSPs and IMPs could rationalize their vendors while increasing their supply base -- the ultimate in shared services for strategic supplier management. Our new ebook will demonstrate how. 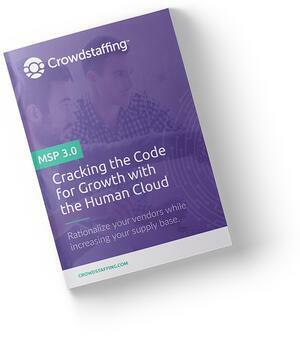 We’re proud to provide this premium resource to help our valued MSP partners unlock the secret to growth - to move from surviving to thriving. Please fill the form below to download your guide.